Posted on Thursday, August 5th, 2010 at 10:26 am. Today I have a challenge for you that will automatically make your diet a whole lot better — by just adjusting what is in your kitchen. So what should your cupboards hold and what should be off limits? Start with my quick suggestions below, and then let’s see what you and others can add in the comments section. Grab a garbage bag, print out the list below, and then head to the kitchen. 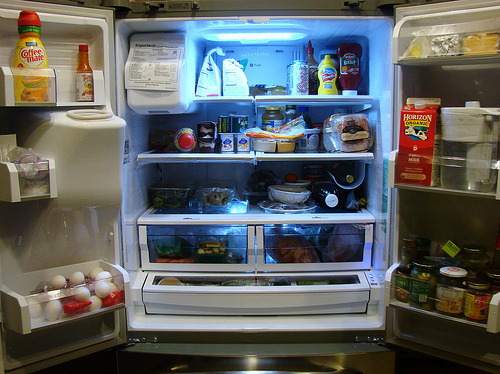 Let’s start with the fridge, the heart of your kitchen. If you find something in your fridge that is on the “Dump this” list, then you know what you have to do. Get that garbage bag ready. Dump this: Beverages with sugar in them (any form of sugar, including high fructose corn syrup, etc). Drinking calories is one of the quickest ways to gain weight, so quickly rid your fridge of such beverages. * Add to your shopping list: Water. It is often stated that most people are partially dehydrated, a condition that is harmful to your health. It’s difficult to verify this, but drinking more water can speed up your weight loss efforts, and will tend to give you more energy and make you feel better. Keep plenty of cold water on hand for proper hydration. Dump this: Sweet snacks of all kinds. * Add to your shopping list: Fresh Vegetables. The produce drawer in your fridge should be overflowing with colorful nutrient-rich veggies. In fact, your fridge should hold more veggies than the drawer can hold. Veggies are filled with fiber, vitamins and nutrients and are a vital part of a healthy well-rounded diet. Dump this: Fruit-flavored yogurt. I hate to break this to you, but that cute individually packaged yogurt is going to do more harm to your waistline than you think. More than 50% of the calories in fruit-flavored yogurt come from sugar. Check out the ingredient list and you might be surprised. * Add to your shopping list: Plain low-fat yogurt, Greek yogurt, or low-fat cottage cheese. If you love yogurt, then get the low-fat plain version. You can even chop up some fresh fruit or berries, and stir them in. Another option is to have a scoop of low-fat cottage cheese with chopped fruit or berries on top. Berries are low glycemic, and have more antioxidants and micro nutrients than most other fruit. Also, frozen berries may have the most nutrition of all, since they are picked when ripe and perfect, and immediately frozen, rather than sitting out for days of transportation. Now, as you do this, you’ll probably notice other things to get rid of, notice other things you want to add, and perhaps have questions. Please comment below on what other ideas you have, or if you have any questions (or disagreements!) with what I said above. Don’t procrastinate, do it now! Hey, I know you’re probably still hesitating. Just get started, and I promise you’ll feel really good about yourself for doing it. In a few days, I’ll be back with another post to take on the freezer. P.S. Don’t forget to comment below, and maybe we can get some more valuable tips. you’re still BUYING water from a store, in plastic bottles? better to put a filter on your faucet, buy a glass bottle or pitcher, and fill it up with water from your own home. LA has some of the best water in the country. Enough with the plastic bottled water. A lot of my bad snack choices were chosen because of their convenience. Now I cut up lots of fruit and vegetables and keep them in the fridge so that it’s right there and ready to go!! What about string cheese? It has a bunch of good protein in it as well as good fats. It’s a quick snack and it keeps things moving during dinner. I agree with the water and the veggies, being a vegetarian, I have plenty of both, and I like the suggestion about the cottage cheese and yogurt, good call. I also buy individual snack sizes, like nuts, to manage my portion control. While individual sizes are a little more expensive, it is worth it so I dont over eat. Great tips! I’m glad to know that I’m on track. Mostly. There’s a high-quality chocolate bar in there that’s been hanging around for about a month, that I’m not going to throw out. Especially appreciate the reminder on how bad that sweetened yoghurt is.